E's aunts stopped by Tuesday night and stayed through Wednesday afternoon. We watched a few shows and decided to go shopping. 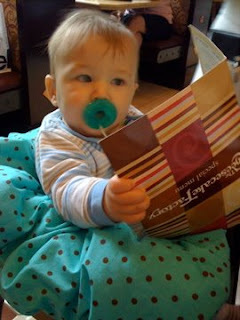 And, of course we had to go to The Cheesecake Factory for lunch! The minute E sat in his highchair, he picked up a menu and started perusing the options :) It was hilarious and all of the ladies at surrounding tables couldn't get enough! E also had his 9 month doctor's appointment yesterday. He is still growing, but has really slowed down now. He is 28.5 inches long and 22 pounds on the nose! His weight has dropped from the 95th percentile to the 75th - length is now still around 50th percentile. Everything looked healthy and he got a new fun book from the doctor - Three Little Caterpillars! I was exhausted by evening, but it was definitely a fun filled day!